Holzer recently recognized security officers during the fourth annual National Security Officer Appreciation Week, Sept. 16-22, 2018. National Security Officer Appreciation Week honors the incredible efforts of our nation’s security officers to create safer and more secure environments. The appreciation week is also an opportunity to profile the many roles security officers fill; debunk misconceptions and stereotypes; and raise awareness of the career opportunities that exist within the security services industry. Security professionals are hard-working, highly trained men and women who are our protectors, guardians and first responders. These individuals deter crime, lead evacuations, provide information, work closely with local law enforcement and are constantly vigilant in their efforts to keep us safe. 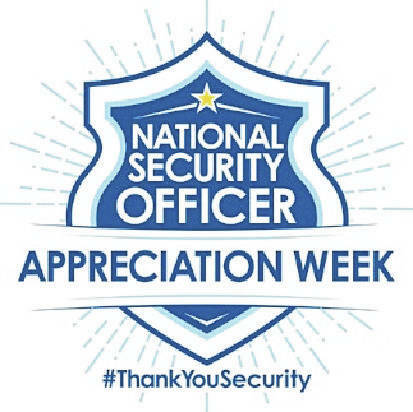 National Security Officer Appreciation Week is celebrated annually during the third full week of September and was established in 2015 to recognize the work of all contract and in-house security officers across all industries. Holzer expressed appreciation to security departments, which provide services at our locations in Athens, Gallipolis, Jackson, and Meigs counties. For more information visit aus.com/ThankYouSecurity.